Video information and scheduling is integrated via RSS feed import, and published automatically. Our ready-to-go, fully featured templates can be customized to your organization's content and design preferences. Station management tools, such as equipment scheduling, are available as add-ons to enhance your website. We help with social media marketing and engagement by adding widgets within your website. Through our experience working with community access media stations, we realized that for many organizations, a fully customized website could not fit into the budget. Our SaaS product remedies price constraints as it starts at a lower price point, and includes additional features that can be added on at any point. Below we will outline the main features and benefits to this product and explain how it can help take your station to the next level. Please be sure to visit the packages and prices page (see right sidebar) to get a more in-depth look at the optional features and functionality available through the CMP SaaS package. With 6 years of experience working with the community media industry, Polar Design has the expertise needed to build online solutions that address common problems faced by PEG centers. One of the most important features a PEG center website should have is a full Video-On-Demand (VOD) catalog. VOD provides many community media centers an opportunity to defend their audience and even expand it by providing content that promotes social media sharing and search engine rankings. Unfortunately, most community media centers and PEG stations implement VOD imperfectly – e.g., a link to a YouTube page or just embedding a video playback system’s player on the website – which provides no benefit or SEO. 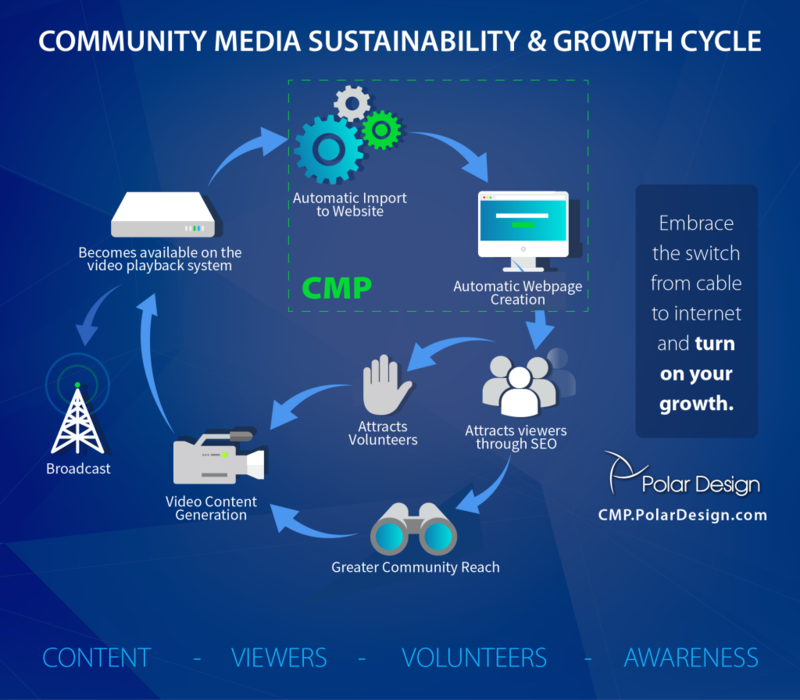 Polar Design’s Community Media Platform is a Software as a Service based system that integrates your website readily with leading video playback solutions like Leightronix, CASTUS, TelVue, Tightrope and can be made to work with others. Our VOD import module pulls videos from your playback system and automatically publishes them onto channel, program and episode pages. This process increases your site’s link popularity among additional factors that benefit your SEO that’s outlined in our infographic above. Polar Design has been working with community access media stations since 2011 with our first customer, New TV. Since then we have designed and developed websites for Holliston, Braintree, Fall River, Milford, and Burlington. These websites have been vital in helping those organizations establish a significant online presence with video archives, member signups and management, DVD orders, equipment scheduling and more. Sites designed and developed by Polar Design show serious gains in visitor traffic and engagement. More visitors find our clients more often in search engine searches, and the mix of attractive, usable interfaces and social media integration increases user engagement and return visits. All of this benefits PEG / Community Media stations awareness in the community and strengthens their relevance for providing vital communication services to those in the community that prefer online. Please don’t hesitate to call Sales at 781-404-4000 x1 or send us a message to schedule a no-obligation meeting to assess your current digital communications needs and identify solutions that your center might benefit from. We can integrate your website with multiple video playback systems, including Tightrope, Castus, Leightronix (PEG Central) and others. The video information you already have in these systems can be pulled to your website via RSS feed, with each video given an individual page. This creates hundreds of SEO-optimized webpages on your site that will help your organization be found more easily on the web and by a larger audience. In addition, scheduling information can also be pulled and integrated into the site into a schedule widget and schedule pages for each channel. When setting up your website, choose from many design elements and styling to create a customized look that fits your brand. This includes your logo, color scheme, font, header layout, button type, and more. In addition, customize your home page by choosing a slider type, featured boxes and widgets to highlight what is most important to your organization. In addition to the basic package, station management tools can be added so that your website improves overall business operations. For example, the equipment rental and scheduling module allows users to rent equipment online by signing into their account, viewing available rental dates, and making the reservation. Social media is important for any company's online presence, and community media is certainly no exception. With our Twitter, Facebook, and YouTube integrations, site visitors will see your social media activity and find it easy to engage online. With the e-commerce add on, your website can process transactions that can help bring in revenue and reduce payment time. The DVD Store module allows a listing of all available DVDs for purchase, which users can add to their cart, pay for online, and pick up in person as usual. Interested to See CMP in Action? Get a tour of sites built with CMP technology.